The A.Roma Hotel has incorporated many motifs from the household of Livia Drusilla, also known as Julia Augusta, of the Julio-Claudian dynastic period. Many walls of the hotel are decorated with hand painted frescos from the period. 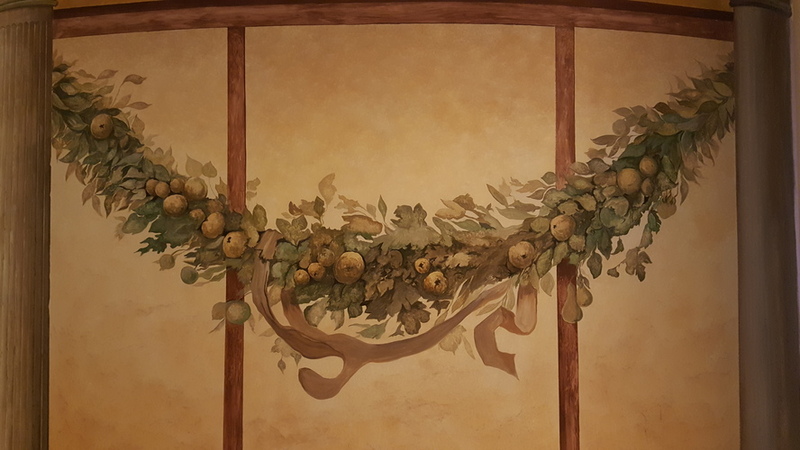 The first one is painted on the cylindrical wall overlooking the restaurant area by the lobby bar beyond the reception area. We chose this not only for its intrinsic beauty, but more importantly because during this period Roman art started to reflect distinct eastern influences. Some of the fresco paintings from Villa di Livia, currently housed at the National Museum of Rome, show remarkable resemblance to oriental paintings! There are many landscape scenes which one would expect to occur more often in oriental art than in typical Roman design. This period was the beginning of the rise of the Roman Empire together with the rapid development of the Silk Road. There is clear historical evidence that both the West and the East not only traded commercially but also exchanged fundamental cultural concepts. Sapori del Mondo or Flavors of the World is A.Roma’s main restaurant. We have brought together chefs from around the world to offer ten different international cuisines for our guest’s enjoyment. The ceiling of Sapori del Mondo is painted in gold with world maps of various dimensions dispersed across the surface to symbolize the ideal that all countries are equal regardless of size. In the restaurant area, three statues of playful kids represent the inner child present in all of us, full of innocence and joy. The three children each exemplify one important characteristic of humanity. First, the child with the mask and the fan suggests that one needs to be a learned and lettered person. The mask symbolizes western literature as it is often used in Greek plays. The fan represents the classic eastern scholar who almost always carried a fan. Second, the child carrying the two water buckets means that one must work with both integrity and diligence. Third, the child acting as a court jester represents our sense of irony to life’s events and that one should also be able to face the world with jest and humor. The A. Roma Hotel has two sets of statues representing the Four Seasons. One set is of a modern design and fabricated from Roman Travertine marble and steel. It can be found in the outdoor fountain area. The second set, situated indoors in the restaurant and spa area, are of four classic goddesses, each illustrating one of the four seasons. 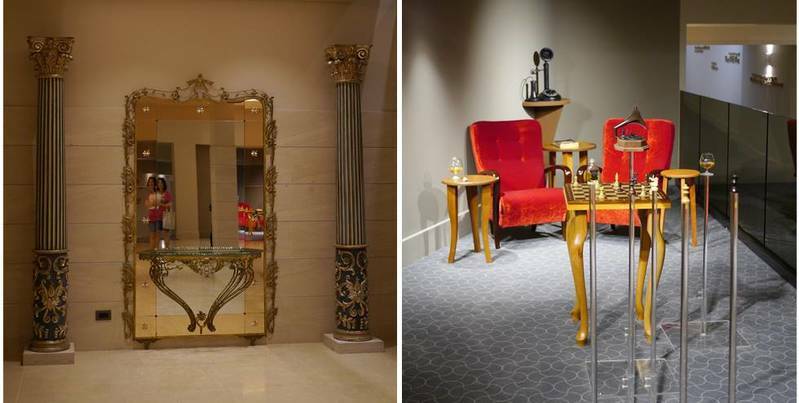 These artworks denote the hotel’s belief in both the classical virtues as well as our use of the latest in technological innovation. In the central circle of Sapori del Mondo, we ha&ve commissioned a sculpture of The Tree of Life. The concept of The Tree of Life exists in all cultures and religions as well as in mythology and philosophy. From The Tree of Life, guests can pass through “The Food for Thought Tunnel”, which connects Building A to the conference center in Building B. In the front of this tunnel there is larger-than-life metallic bamboo sculpture. In the Chinese culture, bamboo is the symbol for the scholar and the gentleman. Springing out of the soil, bamboo stands straight but swings with the wind and epitomizes the virtues of tenacity, integrity and gracefulness. On one side of the tunnel there are classical Latin sayings from throughout history. The opposite side of the wall is lined with more recent well-known Italian quotations. In between the Italian quotes are several display areas with art works representing the essence of Chinese calligraphy. 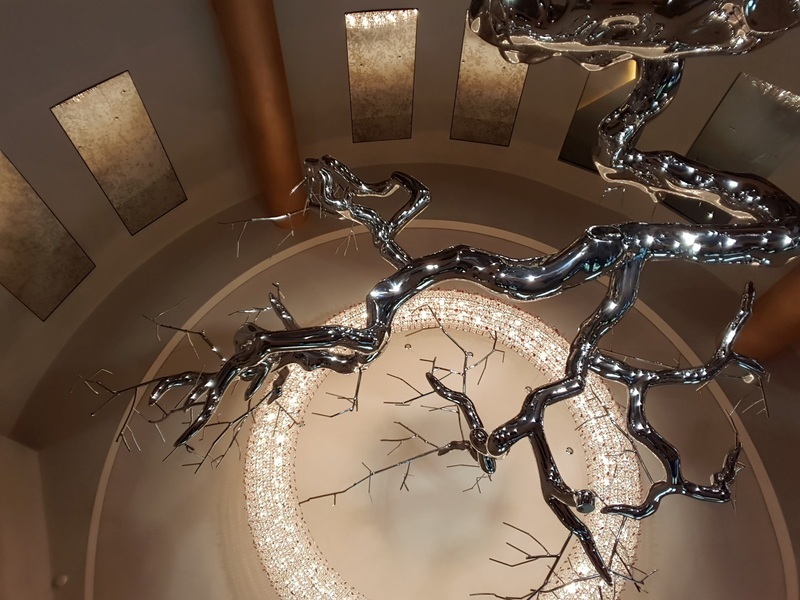 There are two other groups of art in the hotel, which are related to calligraphy namely Ink Rhyme and Ink Force. Together they represent the philosophy and technique of calligraphy and painting in eastern culture. These can be found along the entrance hallway and a tunnel in the basement connecting the two buildings. In the East, writing and painting are truly two sides of the same coin. One must learn how to use the brush to write before one can paint. Calligraphy, therefore, can also express each individual’s emotions, just like paintings. In classical times, famous Chinese painters were learned scholars and vice versa. The name of each artwork embodies both the method and the spirit behind the brush writings. In the middle of the tunnel there is an entrance to Spa.Roma. Several of the Spa.Roma walls also have health-related quotes in Italian. This plethora of phrases demonstrates our fervent belief in the power of words to influence all civilization. At the end of tunnel on the right, is the Illusion Amusement area in which guests can have fun and take humorous pictures. The Amusement area demonstrates that everything in the world changes depending on each individual’s personal perspective. Facing the tunnel, there is a steel sculpture named Fertile Earth flanked by two natural stone-like tables made of steel and several cloud shaped stools. On the opposite wall there are two ceramic art works named “Growth / Raise” next to a green area of live plants. These represent A.Roma’s wish that all our meeting room guests will have fruitful results as well as our respect for Mother Nature. Spa.Roma also houses a larger-than-life backlit Roman torso sculpture and two oriental meditation bronze sculptures aptly named Cleansed. 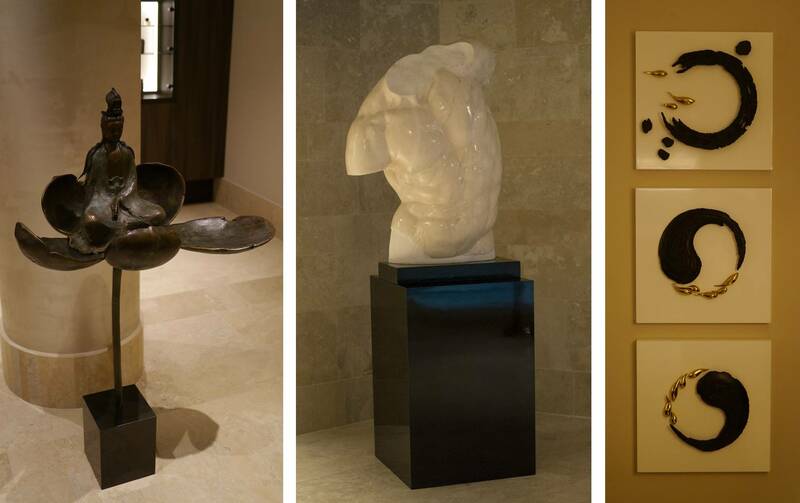 These artworks link the thermal waters of the contemporary spa with the ancient Roman baths in coordination with oriental shiatsu massage and the modern shower design. We wish all our guests will be completely cleansed in both their body and their mind after their experience at Spa.Roma. Walking outside of the spa, our guests will find an outdoor pool and a large garden with a long strolling path. The pool is designed as a natural pond with a sandy bottom and descends gently from the shallow water slowly into the deeper center. 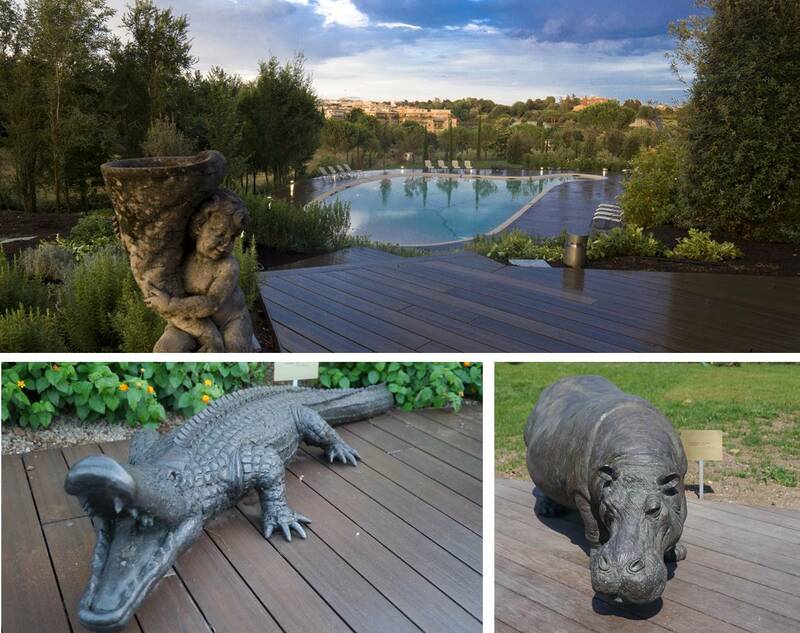 A bronze hippopotamus and a bronze crocodile are found on the opposite side of the pool. The inspiration for this design came from a 1st to 2nd century mosaic of a Nile River landscape found in an old villa on the Aventine Hill of Rome. The mosaic was created during at the height of the Roman Empire, which openly welcomed as well as absorbed foreign ideas. 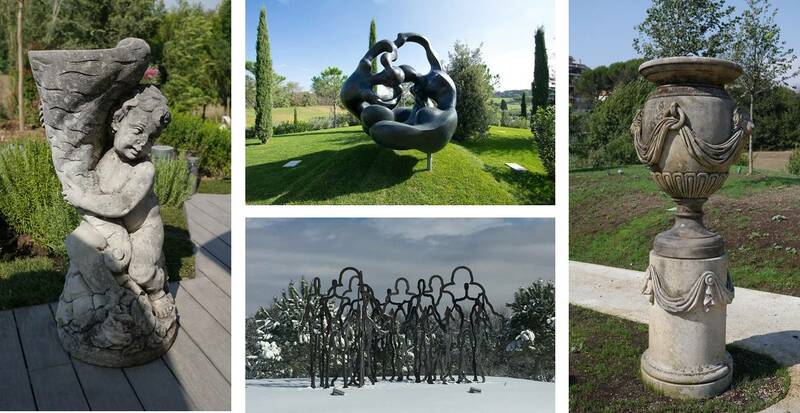 The hotel’s large outdoor garden and walkway have many different sculptures, which include traditional Roman stone garden sculptures as well as three large modern metallic sculptures, named Kiss, Life and City Transformation. They symbolize that only through love, nature and life can one transform and rebuild a modern city.